Jorge Martínez 'Aspar' won four motorcycle World Championships in the 80cc and 125cc classes in the 80s, and this game (released outside Spain as Grand Prix Master) sees you competing in the 80cc World Championship, which consists of seven tracks and a total of twelve other riders. 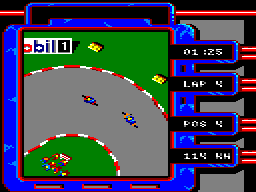 Unlike most other racing games, you get an overhead view of the track, rather than a view from the motorbike. You can practice each track before attempting to qualify and ultimately race, which is a good thing, because qualifying isn't easy. Your bike has a turbo booster which you need to use in the corners to maximise your speed. Getting the hang of qualifying and racing will take a lot of practice, but it's worth it, as the game is a lot of fun once you've mastered it. Watch a YouTube video of this game by: Retro Danuart. America's highways are ruled by lawless anarchists, and the juggernauts that travel all over these highways now require armed protection. You're in control of one of these lorries and have to shoot all the cars and motorbikes that come up behind (and sometimes in front of) you and attack you. As well as a gun, you've got a flamethrower and some mines, although these are limited. At the top right of the screen, you can see how damaged your juggernaut is, and if any section becomes badly damaged, the juggernaut will burst into flames. The graphics are good, but I found the action to be a bit dull and repetitive. Joystick-waggling games are normally the bane of my life, so it's refreshing to see such a game where battering the hell out of the joystick won't work! Better still, it can be played using a keyboard! As you might have guessed, you're taking part in an assault course and you must complete the course within the time limit. It's all about getting a sense of rhythm – if you lose it, you'll fall off some of the obstacles, which is rather easy. It is possible to complete the courses, but they're all much the same, really. The Falklands War of 1982 saw British forces retake the Falkland Islands after it was briefly occupied by Argentina, and this game is very loosely based on it. The game begins with you controlling a British warship and firing at enemy ships – although you can't adjust the range of your gun. 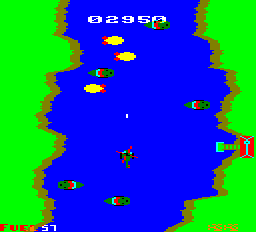 At any time, you can launch a helicopter, where you must dodge and shoot enemy planes. If you reach land before you run out of fuel, you must then fly your helicopter through a narrow channel and dodge even more enemies, while occasionally stopping at huts to collect troops and refuel. The gameplay is badly flawed, particularly in the first stage, where the best way to survive is to avoid confrontation with the enemy ships. The graphics are rather basic and there's very little variety in the enemies you encounter. Recover the seven missing pieces of Getafix's cauldron so he can brew his famous magic potion, or else the small village of indomitable Gauls will no longer be able to hold out against the Roman invaders. As always, it's up to Asterix to save the day accompanied by his ever-ravenous friend Obelix. Make your way around the village, its forest, the surrounding fortified camps and even the Imperial capital itself whilst engaging in combat with nefarious legionaries, wild boars and even a Gladiator in the quest set before you. It's a nice looking game, but it has no sound and is ultimately way too difficult as the fight sections are a bit of a gamble. 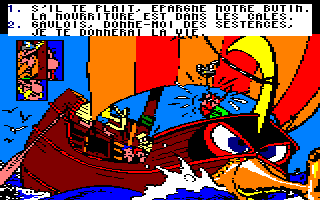 See also: Asterix Chez Rahazade. 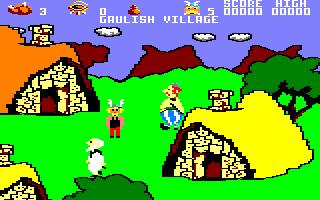 Asterix and his colleagues are surprised when an Indian fakir, Kiçah, arrives at their village looking for help. The monsoon season has passed, and the Ganges valley, where the fakir comes from, has not seen any rain at all. Kiçah wants Asterix, Obelix and Cacofonix (or Assurancetourix as he is known to French readers) to travel to India before Princess Rahazade is sacrificed to the gods. This is a graphic adventure where decisions are made based upon choices you make during conversations with the characters. Among the places to visit are Roman camps, Rome itself, a pirate ship, and ancient Greece. The graphics are spectacular, but the game can become slightly wearisome, and there seems to be no indication of how well you're doing. See also: Asterix and the Magic Cauldron. The simplest games aren't always the best as far as I'm concerned. 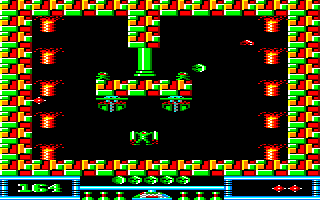 This game sees you controlling a spaceship and flying it around a maze, firing at enemy spaceships and watching out for laser beams that pop up randomly to block your path. Once you destroy all the enemies, you're faced with the same thing all over again. The graphics are extremely blocky, albeit colourful, but there isn't much sound – and why should there be? Nonetheless, there's only so much I can take of this game; it gets boring rather quickly for me. This is a simple and cheerful little game that starts off being addictive but becomes a bit frustrating. You control a ball which constantly moves left and right and bounces off the walls and anything else it comes into contact with – you can only move it up and down. The aim in each of the sixteen screens is to collect four objects within the time limit and avoid hurting the ball too much. 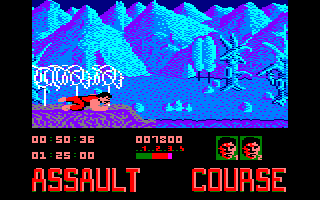 The graphics are brilliant and the music on the title screen is also great, albeit a little bizarre for some tastes. 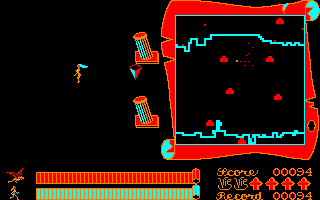 However, most of the game is written in BASIC and the controls can often be unresponsive, and the ball sometimes has a mind of its own. You have been sent to a scientific research base beneath the Moon's surface so that you can repair some leaking pipes. However, the underground caverns also contain many strange inhabitants which cannot be destroyed, and you will lose one of your three lives if you touch any of them. 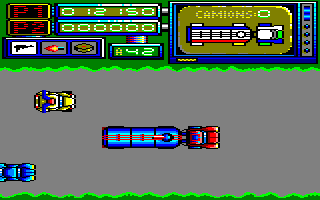 You have a jet-pack to help you avoid them, but it has a limited supply of fuel. Your supply of air is also limited, and you will need to return to the surface regularly to get some more air. This is a very simple platform game with basic graphics and very poor sound effects. The need to return to the surface regularly to refill your air supply, as well as the inability to destroy any of the inhabitants, makes this a frustrating game that you won't want to play again after a few goes. Atahualpa was the last ruler of the Incas before the Spanish came over to conquer Peru, and this game is set in that time period. The whole premise is slightly vague, but you control a young woman and must traverse the maze-like layout of the levels, avoiding the many enemies and collecting scattered items, all of which are shown on a handy map on the right of the screen. Things can get pretty hectic at times, but you are helped by the ability to sprout wings and fly above all the carnage for a limited time. The graphics are tiny and lacking in colour, there are too many bad guys after you, and the whole thing is just very vague and mysterious. There is a nice rendition of Ravel's Boléro during the game, though.